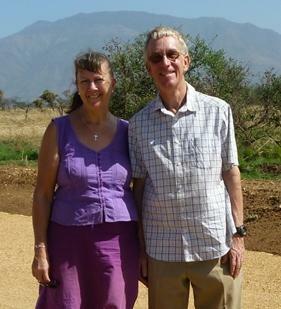 We also support the connections made by Ian and Shelagh Baird-Smith, members of our congregation who are also CMS Mission Associates and spent over two years in Lira, Northern Uganda helping with the running of Uganda Christian Institute for Professional Development providing education opportunities for disadvantaged students in a range of subjects from business administration to nursing. They also helped with Keframa High School, a secondary school for extremely poor or orphaned children. Both of these organisations aim to give poor young people an opportunity for education with a Christian ethos. Since their return Ian and Shelagh have set up a pupil sponsorship scheme. Information below. There is also a newsletter available giving news of their recent visit back to Lira, see below. 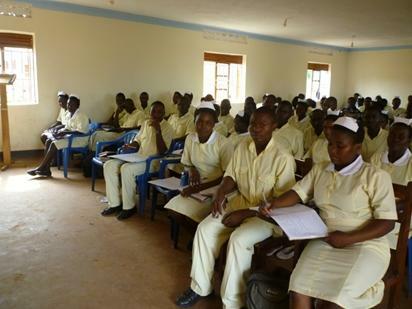 Over the past few years Sam Omara, the Director of Uganda Christian Institte has been developing the two campuses, one for the School of Nursing and Midwifery and one for the Schools of Agriculture and Business. Both are now fully approved by the authorities and are growing steadily. Sam is now (early 2019) replacing one of the original buildings at the nursing school and hopes to develop student accomodation for the Agriculture and Business campus. In the last year they have bought a bus to transport the students between the School and hospital for the practical sessions for the nursing and midwifery courses. He is looking for more land so that the Agriculture students can have a good sized area to practise their learning. Keframa High School as it was on the old site. In March 2019 the first phase of the building of the new school will be officially opened and provides Keframa with Classrooms, Laboratories, Library, Computer Lab and Offices to the proper standard. Here is the new building and it should be painted in time for the opening ceremony. We have a fund (Holy Trinity Mission Fund) which is used to support members of the church who want to take part in mission opportunities. It is also the route through which we can support mission organisations. If anyone wants to apply for support from the Mission Fund, then contact the Mission Committee or directly to Ian Baird-Smith. This is also used for donations to one-off appeals and similar worthwhile causes. We support the work of Maj Simon Farmer, Chaplain to HM Forces, with the offering on Remembrance Sunday for him to be enabled to provide resources for the soldiers he ministers to wherever he may be. This has included time in Afghanistan, Cyprus and Sierra Leone as Chaplain to the UK Forces supporting work to assist with the fight against the Ebola virus. He has few resources provided directly an our donation helps him minister to the troops. He is currently in the UK at Bovington Tank training camp. Simon was an associate minister at Holy Trinity.